In fast paced world, it's easy to forget that some things need time to properly developed and mature. One of those things is career; whether it's skills, experience, or simply reputation, you don't become a big shot overnight! Here are some of the tips HR professionals have for volatile and impatient young professionals. 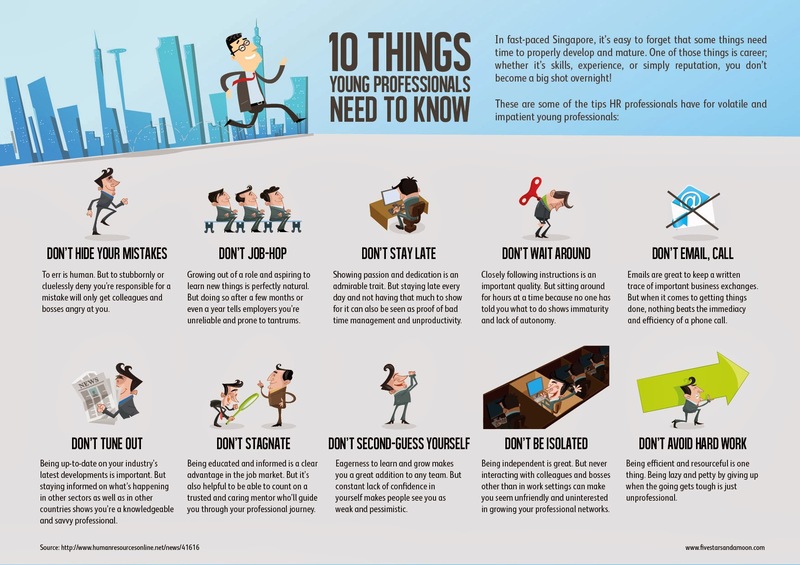 10 things young professionals need to know infographic by Humanresourcesonline. Don't hide your mistakes - To err is human. But to stubbornly or cluelessly deny you're responsible for a mistake will only get colleagues and bosses angry at you. Don't job-hop - Growing our of a role and aspiring to learn new things is perfectly natural. But doing so after a few months or even a year tells employers you're unreliable and prone to tantrums. Don't stay late - Showing passion and dedication is an admirable trait. But staying late every day and not having that much to show for it can also be seen as proof of bad time management and productivity. Don't wait around - Closely following instructions is an important quality. But sitting around for hours at time because no one has told you what to do shows immaturity and lack of autonomy. Don't email, call - Emails are great to keep a written trace of important business exchanges. But when it comes to getting things done, nothing beats the immediacy and efficiency of a phone call. Don't tune out - Being up-to-date on your industry's latest developments is important. But staying informed on what's happening in other sectors as well as in other countries shows you're a knowledgeable and savvy professional. Don't stagnate - Being educated and informed is a clear advantage in the job market. But it's also helpful to be able to count on a trusted and caring mentor who'll guide you through your professional journey. Don't second-guess yourself - Eagerness to learn and grow makes you a great addition to any team. But constant lack of confidence in yourself makes people see you as weak and pessimistic. Don't be isolated - Being independent is great. But never interacting with colleagues and bosses other than in work settings can make you seem unfriendly and uninterested in growing your professional networks. Don't avoid hard work - Being efficient and resourceful is one thing. Being lazy and petty by giving up when the going gets tough is just unprofessional. 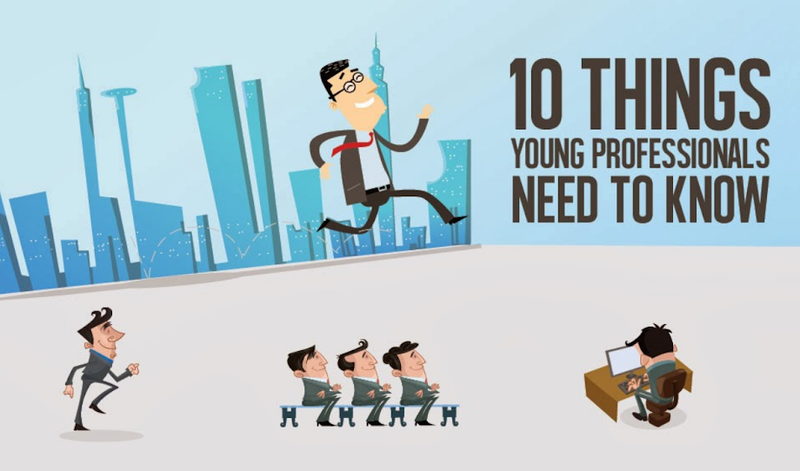 These 10 things in the infographic you might be able to teach to young professionals in your industry to help give them some perspective as they grow and mature in their current role. Let me know in the comments if you have more tips for new professionals.